Conor McDonough drives past a hard screen. A hard foul from Weymouth’s Norman Sianne. Earlier this year, the Weymouth boys basketball team lost to Walpole in a thriller at home, 59-56. On Tuesday night, the Wildcats would get their revenge in Walpole, defeating the Rebels by a score of 60-44. The game was tight for the first half, with Walpole taking a 16-11 lead off of an offensive rebound and put-back from Conor McDonough. Unfortunately, from Walpole, some sloppy play and a deep three from Weymouth’s Paul Foisy had the teams deadlocked at the half, 17-17. From that point on, the game became a duel between captains: Walpole’s Matt Falvey and Weymouth’s Paul Foisy and Norman Sianne. Falvey pointed out how well the Weymouth captains played. Falvey played well himself, both offensively and defensively, but Foisy was too good on the night. At one point, on back to back possessions, he got his own rebound off of a missed three and was fouled on a layup, then was fouled on a made three-point shot. 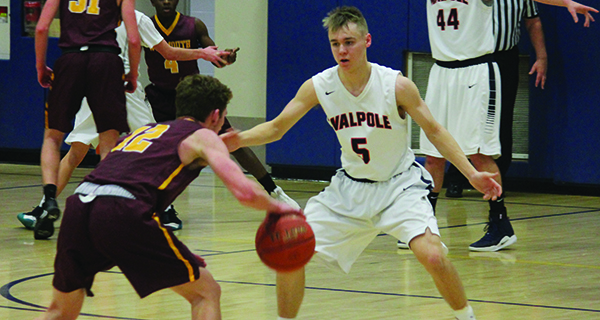 By the end of the third quarter, Walpole trailed, 35-25. From there, Walpole was forced to bring pressure and try to speed up the game. 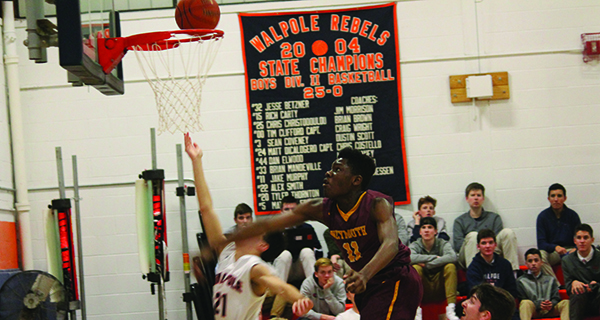 A three-point play from Falvey and a big corner three from Matt Chamon had Walpole within nine, but a devastating offensive rebound off of a missed free throw by Weymouth’s Norman Sianne essentially ended the game. From there, Walpole’s press was broken a couple of times rather easily, and the game ended 60-44. With two teams this evenly matched, the difference between Walpole’s winning effort in Weymouth and their losing effort at home wasn’t wildly different. Captains Paul Foisy and Matt Falvey face off. Still, Falvey was unwilling to either heap loads of praise or blame on any member of his team, noting that while they are now 2-12, every win or loss is a team effort.